All around John, the clicks and ticks of new creatures. Earth has changed since he last knew it. The old land is harsher, now. Unforgiving. Even the animals hes known have changed. On the first evening he fights a domoeode wolfpack made more deadly by the cunning parasites that have bonded to them. 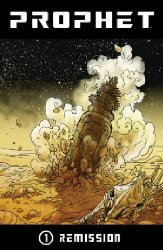 Quietly riveting science fiction from Brandon Graham (KING CITY) and drawn by Simon Roy in a way that demands you linger over every detail just as John Prophet must too. And the details do reward: Id take a close inspection of that oonaka farm, if I were you! The creatures themselves are deliriously alien mutations which avoid all visual clichés, as does the language. Sci-fi nomenclature often makes me wince, but not here. Theres a keen sense of survivalism in the sparse tools at Johns disposal, and the second batch in Jell City proves highly imaginative. Far from overwritten in the third person singular, present tense, one forms an immediate bond with the dispassionate, observational author which is absolutely entrancing. Johns mission, by the way, is a pretty tall order. Youll see what I mean when you get there. I wonder if John ever will.